CRAFTYisCOOL: 2,000 Facebook Fans Contest! Over the weekend my Facebook page got its 2,000th fan! To celebrate, I've come up with a contest to reward a couple of lucky people. The main reason I started CraftyisCool was to make stuff for my kids. Then every time there was a birthday or holiday, I made something for someone. If you make stuff, you know the absolute feeling of joy that comes from using your hands to make something and giving it to someone you care about. The look on his or her face, the comments, the appreciation: they are the payoff for your hours of hard work. I've been on the other end of this too. I have a big family and now that there are lots of grandkids, we adults draw names at Christmas to buy one gift for one person. Last year my twin sister knit me a pair of slippers. I cried! The sentiment was so touching. I know the hard work that goes into something like that and it just made me feel so special to know someone had spent the time to make something just for me. 2) the best handmade gift you ever received and how it made you feel. Also include your email address and your choice of prize (listed below). On Friday, October 28, at 5:00 cst I will randomly select TWO winners from all of the comments and post them here and on my Facebook page. 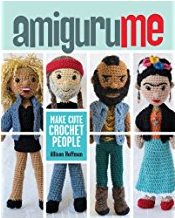 Each winner will receive a special CraftyisCool amigurumi kit! The kit will include a hard copy of a pattern, the yarn needed (a full skein in the colors I recommend), and any notions (eyes, thread, etc). If you crochet, you'll get a full project to make for the holidays! If you don't crochet, this will be the perfect jumpstart! Or you can gift your package to someone you love. PLEASE remember to LIKE CraftyisCool and PLEASE include your email address in your comment. I will not be able to directly contact you if you won unless your email address is included in your reply! Thank you so much for liking what I do! Be sure to let your friends know too. I made some hand tied blankets for my dad and brother that had a beautiful fire fighter image on it. Being that they are both fire fighters they loved them! I would love to win the Alice kit... I'm a big Wonderland junkie. I knit a simple cowl for my husband last year and he loved it, he wore it all winter. I am an avid crocheter because of my Mother (She taught me when I was 6 yrs old). The handmade gift I received was a beautiful Irish bedspread my mother crocheted 30 years ago for my wedding shower. It was very intricate and hard for her to crochet since she had broken her wrist that year. Sadly, my Mother is now in heaven. This bedspread reminds me of her love and memories of time spent with her. This bedspread will be passed on to my first son (since I have no daughters) to carry on her love. I would love the Alice kit. The best handmade gift I ever gave anyone was the afghan I made my youngest (she's 3). She's been carrying around a certain blanket since she could walk and wouldn't sleep without it, but it was too small to fully cover her. When she got her afghan, she immediately dropped her blankie and hasn't picked it up since! It was about midnight, and I had just finished a Gooble doll from Yo Gabba Gabba (using the Muno Pattern!) And my 2 year old daughter woke up and came out into the living room. She crawled up on the couch with me, and while I was explaining that it was night time and she needed to stay in bed, she saw Gooble laying on the coffee table. Her face lit up like it was Christmas, and she said, "Gooble". I gave him to her, and she smiled really big and raised up her eyebrows! She was hugging him as she went back to sleep that night. The best handmade gift I was ever given was a very big and just beautiful embroidery of Winnie the Pooh (I love him!) with the words "I love you" stitched on from my AWESOME husband!!! The best handmade gift I've ever given was a amigurumi bunny (my second attempt at it lol) I gave to my niece. Her reaction was SO precious and it made me feel like I did something wonderful. I would really love the Alice or Oompa Loompa kit! The best present I received was a crocheted coverlet that my mom made for me as a wedding gift. I think the best gifts I've made are all of the stuffed animals for my daughter. If it wasn't for her, I may not be the crocheter that I am. csolar@somdnews.com Alice would be WONDERFUL!!! After my Grandmother passed my Grandpa refused to sleep in or touch the bed that was theirs. He was sleeping on an old pink chair that they had in the living room and would leave his work cloths and shoes on and just fall asleep there. I was worried about Papa getting sick *he's 74* so I made him an Elephant Afghan in his favorite colors. He was telling me a few weeks ago how much he enjoys it and how it keeps him warm when he forgets to close his window. Sometimes you can just see how much your gift touched their hearts. The best handmade gift that I have received is a green blanket from my Grandmother Flo. She has made wonderful gifts throughout the years, but this one tops the list. The story associated with this is ironic. When I was about five years old, I carried around a blanket. My mother was quite concerned about this habit so she slowly began to cut away at the blanket until it was so small that I no longer used it. Then, she was able to throw it away. Grandma Flo took this as a signal and opportunity to crochet a blanket for me that was twice the size of my original blankie. It is a green color, and it is well over thirty years now. Everyone knows about greenie; even my college friends. Greenie has traveled lots of places with me. Now, I am crocheting a greenie for my son, who is 15-months-old. I want him to have something to console him when I am not there, just like Grandma Flo did for me when she crocheted greenie. 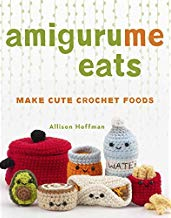 I love the amigurumis that you create. They are amazing. I am in the process of creating Brobee for my son. I purchased a bunch of your patterns, and I have to say that they make me very happy. I love Alice, and if I win, I am going to crochet her for my niece, Ava. I just want to also say that that I have enjoyed reading the comments that everyone has written about their favorite handmade gifts. I almost cried twice reading the stories. Making items for other people is such a wonderful gift of your heart and imagination. The best hand made gift I ever received was a custom mix cd that my boyfriend made specially for me. It wasn't just a bunch of mp3s slapped together, he actually made it like you would for a real radio show. He recorded himself as a DJ, mixed his own breaks, did voices of other "callers" and mixed the songs so they flowed into one another and not just end abruptly. He even came up with a design on the cd itself and had it etched onto it. Best mix ever. Sorry, I had to delete the first one, I didn't include my prize should my name be selected. Oops. The best handmade gift I've ever given was a beautifully (and painstakingly stitched) afghan for my sweet 2 year old son. Not because it was anything super special, but I've only recently taken up crocheting and it was my first big project for my firstborn little man. I of course like CraftyisCool on Facebook! I've started making amigurumis a couple of years ago, almost by accident. When I improved enough to make one for a gift I decided to made one for my friends. They play in kind of a band in my university, this kind of band is call "Tuna", and them are called "tunos". It's a group of guys that master the art of flirting with music, to say something. My boyfriend works for a video game company that has is farm based. I made a pig for him as a gift. He loved it so much he brought it to work and put it on his desk. The next day he told me that all of his co workers were saying that they wished their girlfriends would do something like that for them. I love making things for my family and friends. I am hoping to make some dolls for my classroom. I would love to have the Alice pattern. I have made so many gifts for others but I think the reaction I always like best are the reactions of children! They just get so excited! They squeel and look so cute in whatever I make...I love it! m.moonmama@gmail.com and I would love Pee-Wee! I made my bestie a Princess Leia bun hat for her 30th birthday. She freaked (good freak) and everyone took turns wearing it at the party. Every year now, I have to top it. The best handmade gift I've ever given was a silk batik banner I made of the Madonna and Child. I was just learning how to work with silk and my older sister is a very devout Catholic. She opened her silk banner painting and cried, she hung it in her front room right by the entryway. My sister and I are very close and we have the same genetic disorder, she was not doing well at that time and I know my gift brightened her day and gave her hope. I love your creations and I'd love the Dwight pattern kit as I'm a big Office fan. The best hand made gift I have made is the little monster from your blog. I made them for my son's birthday party this past weekend and I gave them out as thank you presents to everyone. Everyone seem so surprise and happy to get one. The kids especially were very excited to have one of there own. I had to much fun making them. I thank you for making the direction on how to make the mini monsters so easy to follow. If it was not for that I would have never made them. If I win, which I hope I do! I would like Alice, I just love Alice in wonderland and would love to have one. I liked you on Facebook! I guess the best reaction to a gift I made for someone was probably when my sisters and I, who are all "grown up" sent my 90 year old grandfather a Valentine's Day package. Together we made him stained glass wax hearts to hang in his room. I also included a crocheted blue bird to remind him that spring was coming soon and a pair of crocheted slippers to keep him warm until then. We weren't there to see him when he opened it, but we were told that he showed them to everyone in the nursing home. We called him later, and he told us how much it meant to him. It was awesome! I would have to say the best reaction I got was from my niece, Lexi. I crochet the cutest Disney princess dolls in the land (if I do say so myself) and I gave miss Lexi an Ariel doll for her birthday. She squealed and picked up that doll, hugged it tight and twirled in circles giggling. It was so sweet! It's something I will never forget! Thanks for the giveaway! 1) Favorite handmade gift I gave to someone is probably still the pink dress for a G.I. Joe based on a friend's RP character and a prank that had been pulled on his character in game. I even redesigned the box for especially for him. His reaction was priceless. 2) The one that stands out the most is a Star Wars children's book that my online friend painted for me for a wedding gift. I love it and know that my future younglings will too! 1) I made a scarf for my Dad who was going through some health problems and was always feeling cold. It was one of my first projects so it didn't look that great and even when it started unravelling and fuzzing out, he would still wear it all the time. 2,000 fans Whoot!! I love looking at your masterpieces (MJ is my fave next to Dwight hehehaha)! I started to crochet about 14 weeks ago after severley injuring myself, and needing an activity other than internet surfing to occupy my time....I started with a small turtle amigurumi toy to see if I could crochet - it is well loved by my son who playes with the turtle shell"vest" and tries to wear it as a hat. Then I went crazy and started (and finished) a baby stacker toy (one of 2) for twins coming in December. I am so excited and happy, and hopeful that the mum and babies will like the toys, I am just bursting to post pics but have to wait until after the babies shower so I don't ruin the surprise. It is so rewarding to finish a project and have a handcrafted "masterpiece" to share!!! Kit; Assistant Regional Manager (bahahahah) or the Oompa Loompa Please. I made a friend a set of angry bird amigurumi for his birthday. He was so happy he emailed me the next day to tell me he was throwing them around his living room! The best handmade gift I received is a crocheted blanket my grandmother made me. She taught me how to knit and crochet so every time I snuggle up in that blanket I think of her and the hours I would spend stitching away with her. It makes me proud that I can continue that tradition. The best gift I ever made was in the 4th grade I crochet a blanket for my best friend. She still has it! When I saw it in her room many years after I gifted it I almost cried. It's nice to know that it was appreciated and loved. And this is a hard decision to pick one pattern! I love Alice, Conan and Pee Wee!! But I'll have to pick Pee Wee since he represents the silly wacky inner child. The best gift I ever gave was a Christmas gift for my mom. Every Christmas we'd ask her what she wanted and got the same reply: oh Anything or nothing, I've got everything I need. So that year I grabbed a baby food jar, decorated the top, filled the jar full of what she asked for, labeled it "A bottle of Nothing" and gave it to her. It was her first gift so I told her it was her only gift since it was "what she asked for"... well, the look on her face was priceless when she realized what it was! For a few minutes I let her think that that was all we got her until I took pity on her and gave her the rest of her "real" presents. And from that moment on she always had a list ready when asked what she wanted :P That was the best handmade gift I'd ever made in my 12 year old life! Pattern preference: "Assistant Regional Manager"
I crocheted Sonic the Hedgehog from Wolfdreamer for my 6 year old's birthday. His expression was priceless (as was the fact that I was able to keep it hidden from him for months as I slaved over it!!). I love your site and your fan art! Keep the inspiration coming! You know how much I love your work, so it would be exciting for me to try one of your patterns! When I was a little girl, I had a sleeping bag with a broken zipper. My grandmother put a simple backing on it and it became my favorite blanky. I still have it in the top of my son's closet. EARLY in my knitting career, I made that same grandmother an entarsia lap blanket. She used it every day in her wheelchair until she died. That blanket now sits on my couch and we even call it "grandma's blanket"
I would love Alice or the Oompa Loompa designs. I would LOVE a Conan pattern! I would love to win Oompa Loompa. I have made several prayer shawls for people who were in need of a hug or for ones who helped me while I was sick and I gave them a shawl as a form of a thank you. Congrats on the 2,000 fans! I;m working on a surprise present right now for a very special 4 year old friend of mine, whose birthday is TODAY! Using felt, I'm making her a whole grocery basket full of felt food - so far I've finished a slice of pizza (Pepperoni & green peppers), two fried eggs and an iced gingerbread cookie. Cut out and waiting to be sewn up this evening are three slices of bacon, some bologna, lettuce, tomato slices, six slices of wheat bread, two hamburgers, some slices of cheese, two pancakes with syrup, and another half dozen or so of the gingerbread cookies. Time permitting, I'll finish that pizza (giving her a whole pie with different toppings on each slice), a salad, and whatever else I can finish. Boy is it difficult to pick just 1. Coming from a crafting family there have been so many handmade gifts given & received. What comes to mind right now is the hand made silver bead rosary my brother & his wife made & gave me for Christmas last year. 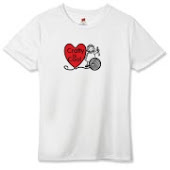 They also made them for my mother & 2 sisters, as well. I think it comes to mind because my sister-in-law passed away this week. When we opened the boxes on Christmas eve she was glowing with anticipation & pride. Being Jewish, she didn't use a rosary herself, but knew that my mother uses one everyday when she attends morning mass. It was a very beautiful & thoughtful gift. Thanks so much again for sharing your amazing talent with so many people! My girls would adore an Alice doll. I've given a lot of handmade gifts, but last year I received one from my best friend. I had once crocheted her a monster bunny amigurumi, and she copied the design in fabric and made a soft plushie! I didn't even know she could do that, so it was a total surprise! It is adorable. It is my gift combined in hers. Something we both love. We make a team. I've been doubting between alice and the oompa-loompa, but I'll go with the oompa-loompa, because I've never seen a better one :). I really been eyeing that Conan doll forever! I crocheted the oompa loompa doll for a co worker. She is terrified of oompa loompa's and we are always trying to find ways to scare her. So after I crocheted this, I went to work and hid the doll in the freezer and waited for her to come to the break room for her break. I told her I brought her something and it was in the freezer. She got excited and ran to the freezer. When she opened the freezer she screamed and slammed the door. She fell on the floor from laughing so hard. She said, he is so cute but I cant take that thing home with me. Even though she wouldnt accept my gift, it was still worth seeing that look on her face when she opened the door. I think the pattern I would like to have next is the pee wee herman. I think the best thing I could receive when I crochet something for a kid is his/her face, amazed, and liking it as much I spent on making it. That's what is special! Dedicating my time with passion, because I love what I take back. Man, that is a tough question! I make mostly every single gift I give - and it is usually well received! (I also ADORE handmade gifts!) But the last thing I gave was to my neighbor who is having a baby. I made her two amigurumi animals - a giraffe and a keroppi and a bib. She absolutely LOVED it. (that response is better than any money I could have received). So - Yay handmade gifts! Here is my email addy: ayanared at gmail. I hope I win! Even though I am a self-taught relatively new "newbie" to crocheting....my fave thing to make is ami.....you can only have so many scarves, right?!! I made an ami sting ray for one of my co-workers when she was pregnant. The top was brown, and the bottom was pink. I loved that pattern so much. And luckily, they were the same colors that she had decorated the nursery in! She was so surprised and loved it so much. I crocheted a bulldog puppy for a friend at work. It looks exactly like her doggy at home. I surprised her by leaving it on her desk and she repeatedly tells me that it's like having her pup in the office with her everyday. 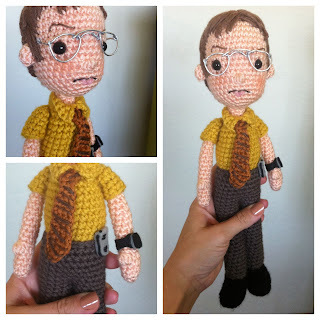 I am always trying to come up with cute, personal gifts to crochet my office family. I've made sushi, peanut butter and jelly sandwiches, birthday cakes, a cactus, lawn gnomes and even a train. Best handmade gifts I've received are my children's special quilted blankies that each of them have been given at their birth by a family member (one from a sister, one from a grandma and one from me!). They are each special and unique and my 3 children all sleep with theirs at night. The best one I've given is my most recent - but then I always think the most recent is the best, because you get better at with each new thing you make :) It was a ami robot made for a friend's new born little boy. It was the third robot I'd made and really felt like I'd figured out eactly how I wanted it by that one! beckyogram@gmail.com I would love the Alice in Wonderland! I made a doll for my granddaughter. Everyone that I showed it to wants me to make one for them. The best gift I ever gave was a crocheted baby mobile. It started with the sun, then rainbow, and the bottom was rain drops. Perfect baby shower gift! last year i crocheted matching hats for my whole family and put them in the new christmas stockings i also crocheted for everyone. needless to say there were a lot of warm noggins at our house last winter! My Mum made the most beautiful hand knitted cardigan for my youngest child, she loves it and asks to wear it every day. She always gives a twirl and says 'So pretty' so even 2 year olds appreciate handmade! I also love the crocheted blankets my mother-in-law has made for all my children when they were born, bedtime wouldn't be the same without a 'Nanny Blanket'. My Mum loved the felt bag with embroidery panel that I gave her for her 60th birthday and I was very proud of how well it turned out, she also loved the platter painted with my 3 older childrens handprints and my, then newborn, daughter's footprints. The best hand made gift I made was for my husband for Valentine's Day. He proposed to me by climbing out of a giant Venus Flytrap "Audrey II" puppet at the end of a high school production of "Little Shop of Horrors" that I had directed. I re-created it in Amigurumi. I adapted your Wonder Woman and Pee-Wee patterns, to make us. I used an oval and LOTS of bobbles to make Audrey II. It sits on our mantle and is a great reminder of a happy day! Before I discovered Crafty is Cool the only things I crocheted were zig zag blankets and pot holders - now I am obsessed! Thanks for all you do! The best one i received last year was a handmade blanket, all patchwork. and the best i gave was an entire crochet blanket for my mom. lots of work but totally worth it! I made a purse and scarf set for my little sis (13 yr old) last christmas! My mom told me that she would not take the scarf off! I am figuring out what I'm going to make this year. It's hard to choose just one handmade gift I have given as being my favorite. I love to make things that are personalized. Most recently I made a Onesie with Prince's famous purple guitar on it for my husband's cousin. I love the reactions when I give something I made with my own hands! I would love to have the Pee Wee pattern. He is my all time favorite! The first "big thing" I knit was a blanket for my daughter, I hope she preserves it all her life. I'm an Alice and I love the Alice's kit! I recently crocheted a matching skirt and top for a big sister and her brand new baby sister. Wish I could attach the photo here but my phone won't let me. 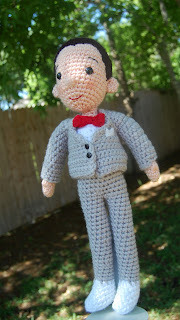 I crocheted Pee Wee and Chairry for my friend's birthday. She loved them! It's so hard to decide which thing I've made for someone was my favorite but It's probably a scarf I recently crocheted for my bff. A. Because I learned to make cables and B. When she opened it she was literally speechless, instantly wrapped it around her neck and then sat and talked with me for over an hour in the house wearing it!!! I am very blessed to have a bff who truly loves and appreciates everything I make her. I love every handmade gift I receive. I don't think I can choose one. I love the handmade quilt from my Grandma. I love gifts from my mother-in-law. I love giving handmade gifts. I don't think there is anything more special than giving someone something you spent time on.Thanks so much and congrats! The best gift I've ever given someone was a scrapbook of my daughter's first year to my Mother. She loved it so much and cried at the turn of every page. She even keeps it out for people to look at it when the come over. It´s pretty hard to decide, but I think I have to go with one of the "Heart cats" I made for a charity organization (they collect crocheted cats with a stitched heart to give to heart sick children in hospitals). I received an email from one of the family's who received one of the cats, my heart just swelled with happiness to hear the joy the little girl felt to receive the gift. Absolutely amazing. I love little Alice, that would make a perfect gift for my little niece. I would like Alice - I made an afghan for a convention I went to and guess who won it. I gave it back and said please draw someone else's name I don't want this afghan. The look on the guy who drew the ticket was priceless. Of course he didn't understand that I carried it from the USA to UK and I wasn't about to carry it all the way back I had to make room for other things (LOL) Of course a friend told him why and then that look was even funnier. I made my cousin's kids gifts for christmas last year. Her daughter could care less about her little frog, but I made her son a minion from despicable me, and he loved it! I believe his reaction was "oh, awesome!" I'm currently working on a kitty ami for my niece, and cat wait to see her reaction! She is 2 and calls all my cats "baby" (on purpose, she knows cat) so I decided to make a baby for her own! I also made a gnome for my sister, who loved it so much she velcroed it to the top of her tv! Before my son was born I made a hat/blanket combo for him. Then I made a matching hat for myself. we took him home from the hospital wearing it. Now I just hope to be able to crochet a pink one soon. I crocheted a colourful bobbly baby blanket for my friend when she was expecting. She doesn't have a lot of family support, so it meant a huge amount to her that someone had taken that kind of time to make something for her baby. She was so touched; I'll never forget her face when she unwrapped it and touched every square inch of it in wonder. catlondon at gmail dot com. The best crochet gift I made was an afghan for my mother. It fitted a double bed and took me 3 months to make. I took it everywhere so I could finish it so she would be proud of me, after all she is the one who taught me as a child to crochet. It was a wonderful gift, and when she passed I gave that afghan to my son, he treasures that afghan and hopefully it will become a family heirloom and will one day be passed on to his children. I made a bed quilt for my sister's wedding present. It was a medallion style and each row/border had special significance, mostly related to nature, because she and her husband love being outdoors. It wasn't actually finished when I gave it to her, so I kept working on it during my visit, after the wedding. I put the last stitches in the binding while sitting in the airport, before checking in for my flight back home, which is...well, very like me. We're not a very bubbly, demonstrative family, so there was no emotional outpouring about it, but I know how much she loves it, and I love seeing it on her bed when I visit, nearly 10 years later. I am coastingrichly on gmail. It is so hard to pick a favorite but i would have to say it would be when i made my father (recently deceased) a matching cap and scarf in his favorite college teams colors. He immediately put them on with tears in his eyes. i would love the Conan O'Brien pattern. My favorite handmade gift would have to be anything made by my late sister who died earlier this year.She was very talented with a pencil and anything else that came in her path. All of her things bring a sad smile To my face, even last night I came across sketches she had done years ago and feel they now need to be framed and hung. If I were to win, I'd choose the Dwight K. Schrute pattern. Maybe the Conan. They are both just awesome!! 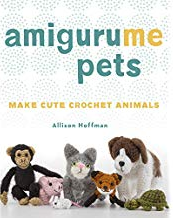 I'd like to take my basic skills to the next level and give amigurumi a shot. I love all the fun things there are to make. The best thing I ever made (at least judging from the reaction it got) was a couple sock monkeys for my girls. They both squealed and the youngest slept with 'Super Monkey' for almost three years. I think my girls would love a couple of Pee Wees (they love that show).